Three workers were killed and twelve others were injured in an accident that occurred at a troubled shipyard in Istanbul's Tuzla, Istanbul governor Muammer Guler told reporters. Three workers were killed Monday and twelve others were injured in an accident that occurred at Gisan Shipyard in Tuzla Shipyards Zone that has been criticized for poor safety standards, Guler said late on Monday. 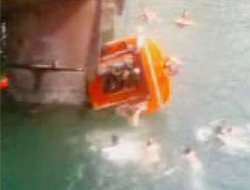 The fifteen workers fell into sea when the ropes of a ship's boat snapped, the state-run Anatolian Agency said. Previous media repors suggested four killed in the accident. A total of 99 workers have died at the shipyard since 1992. The sub-contracting system and noncompliance with the occupational safety regulations in shipyard operations are seen as the major causes of the deaths in Tuzla. Most of the work there is outsourced to smaller companies, which have been accused of employing untrained workers and adopting poor safety practices.